Ed Welburn, the sixth design boss in General Motors' 108-year history, is known for his attention to detail. NEW YORK -- Ed Welburn no doubt drew some blank stares from a group of high schoolers at the auto show here last month. Instead of hearing insider tales of sculpting Corvettes and Camaros, the students listened to the General Motors design chief riff on the Tavera, a bland SUV sold in India. "It may be two families that pool their money together to buy this thing," Welburn said in an interview after his meeting with the students. "I take that as seriously as any other project we work on." 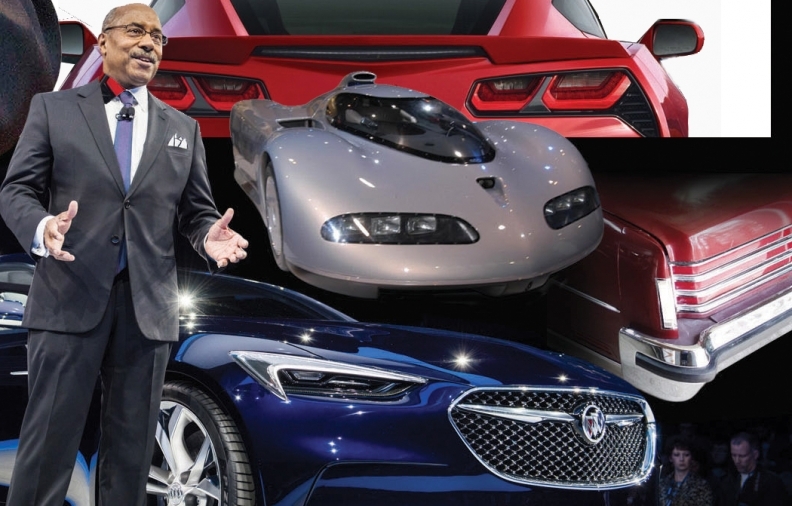 His choice of topic underscores perhaps Welburn's most important legacy as the sixth design head in GM's 108-year history: The globalization of a once-disparate collection of designers and studios. The soft-spoken Philadelphia native has shown an attention to detail never before paid to GM's far-flung vehicle portfolio, colleagues say. (He's been known to make day trips to Sao Paulo or Seoul to OK a vehicle design). In the process, Welburn has orchestrated a renaissance in GM design, one that has helped GM recover from an era of badge-engineered blandness. Welburn, who turned 65 in December, has been racking up the sort of accolades that come in the twilight of a distinguished career. During a ceremony in January to honor the designer, GM CEO Mary Barra said he "belongs with the legends Harley Earl and Bill Mitchell," the company's first two design chiefs, who served for a combined 50 years. Colleagues say he's been in a reflective, soak-it-all-in mode during the recent auto show circuit, a sign he could be preparing to put away his sketch pencil for good. It's a career arc that began soon after he wrote to GM as an 11-year-old to declare his interest in car design (and got a response) and culminated in a seat in one of the auto industry's most hallowed chairs. Welburn remembers his first design that made it to production: the taillights on an early 1970s Pontiac (a Grand Ville, he thinks). He later spent many years in the Oldsmobile division, working on Cutlass Supremes, and later worked on Buick Rivieras. His list of favorites from his tenure as design boss, begun by heading North American design in 2003, is long. Toward the top is the design for the seventh-generation Corvette, which gave the iconic sports car a bit of Euro flair. He's proud of the design direction at Cadillac, the angular art-and-science theme that "refused to simply copy its direct competitors." He counts the Camaro concept that bowed at the 2006 Detroit auto show as one of the most dramatic vehicle unveilings he's seen. "Grown people were crying," he said. But among the designs that Welburn considers most important to his career is a sleeper: the Oldsmobile Aerotech, an experimental vehicle he crafted in the mid-1980s. A.J. Foyt would later drive the high-speed research car to two world speed records. "That was a big part of my development as a leader. Because for the first time, I wasn't just sketching. I was working with engineers, with marketing," he said. "I was working all day in the studios and all night in the wind tunnel. That was the project that I really learned design cannot be an island." Closer collaboration with engineering turned out to be a hallmark of his time as design chief. In the '50s era of tailfins and jetlike styling cues under Earl, design was king at GM, Welburn explained. The design staff would "create the design plan for the car and then throw it over the wall for engineering to make it work." But the pendulum swung the other way starting in the late '70s, when engineering would set the hard points of a vehicle and expect stylists to overlay a design. By the late 1990s, design "was like a small department within engineering," he said. Former product development chief Bob Lutz is credited with reversing that trend and elevating the role of design at GM, a strategy carried out by Welburn and his team. Today, there are entire teams of engineers and designers whose purpose is to set the proportions of vehicle platforms that enable flexibility to execute compelling designs. GM's design division was a fractured enterprise even as late as 2003, when Welburn was promoted to the top North American job. Designers in 10 global studios across seven countries reported to regional executives, not to Detroit. It wasn't unusual for a regional chief somewhere to slap a Chevy badge on an Opel and call it a day. "A Chevrolet studio could do whatever they wanted to do around the world," Welburn said. Welburn soon started making frequent visits to the GM studios in Australia, Korea and elsewhere. By the time Lutz formalized the reporting lines to Detroit under a new global product development structure, "it took about 45 minutes for me to get those studios to line up," Welburn said. The setup has led to a sharing of ideas and customer insights -- and the creative energy that comes from heated competition, Welburn says, such as the global design contest to pen the seventh-generation Corvette, which debuted in 2013. To this day, Welburn sees sketches from that competition proudly hanging in studios from Germany to Australia. 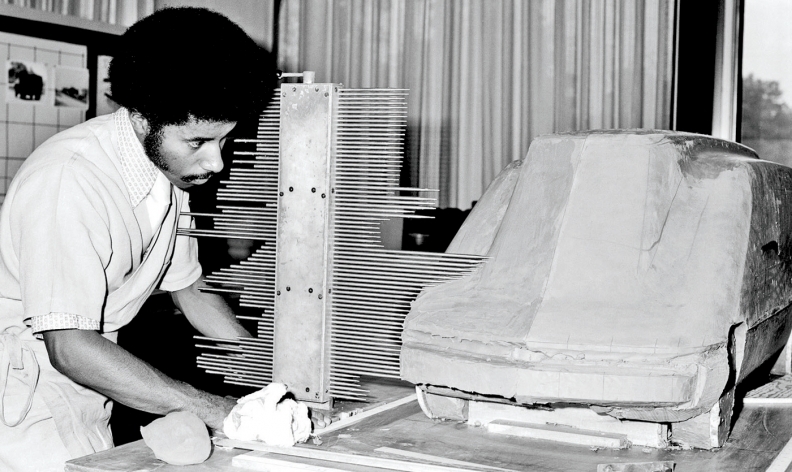 Ed Welburn, seen working during his early days at GM. He worked on Pontiac, Oldsmobile and Buick vehicles. Welburn still quietly sketches on some projects in his office, but he has a firm rule never to bring his noodlings into the studio. "I've seen that in the past that when a leader brings a sketch in, everyone stops creating," he said. Welburn encourages each studio to keep at least one "secret project" -- under the radar of GM management -- to build camaraderie. The fighter jet-inspired Cadillac CTS Coupe that went on sale in 2010 had been a secret design. So was the sleek Buick Avista concept coupe that wowed the Detroit auto show in January. "I like an environment where people feel free to try things and make mistakes," he says. A few years ago, Helen Emsley, who is now global director of GMC design, tested that theory -- perhaps a little too much. Emsley had been leading the interior design of the redesigned 2016 Camaro when Welburn had rejected an idea for a white interior. Emsley -- a sharp-witted Brit who's got a jovial rapport with Welburn -- told her team to go ahead with their project anyway, figuring she had time to soften him up. On the eve of a critical design review before GM's top leadership, Emsley had forgotten to discuss the white interior with Welburn. She visited his office to confess. "You're OK about this, aren't you, Ed?" she recalls asking. "He just said, "No, I'm not,' and sort of dismissed me with a look." By the next day, Welburn had come around and agreed to let her present it. But he decided to have some fun at Emsley's expense. "He announced, "Oh, this is the one that Helen hid from me in the paint shop!'" Emsley recalls. Normally, Welburn's feedback is more subtle. Designers say he has made an art of gentle redirection. Says Mike Simcoe, vice president of design for GM International Operations: "He's very accomplished in making people feel comfortable even as he's taking them down." No successful designer can claim success without killing a sacred cow or two. For Welburn, it was the taillights on the seventh-gen Corvette, the first since the 'Vette's 1953 debut to forgo round lamps. Welburn recalls a heated day in the studio debating mock-ups of two rear ends: one with the traditional round lamps and one with the squared-off version that made it into production. He went home to stew on it. That night, he happened to catch a local TV newscast featuring a Corvette club gathering. All the owners had gray hair, he said, not exactly the demographic Chevy wanted to court. "The next morning, I went straight to the studio and was like, "Go with the square ones,'" he said. "The traditionalists were not happy. But I think we've won them over."